Registration still open for Saturday’s Fundraiser – click HERE and click on the tab for retail store once you have logged into MindBody. Raffle prizes are starting to appear on the counter at the front desk. If you can’t be at the fundraiser on Saturday but would like to buy some raffle tickets, here let Alison know. $1 each or 12 for $10. Items are still coming in, but so far we have out SkullCandy Crusher Headphones ($99 value), Again Faster Gymnastics Grips with 2 blocks of your own PERSONAL chalk, 2 $26 gift Certificates for rokfit.com – workout apparel, Rogue “American Made T-shirt size Large, 6 pack of Fuel for Fire (retail $24) and more! Heats will be run every 20 minutes starting at 9am sharp. Heat Schedule is filling up…if you have a time you are hoping to be in, contact Alison by text (345-4380) email crossfitoakdale@gmail.com or Facebook (Alison Brennan Huberty) and she will do the best to accomodate you. If you are on the fence, please know that you can scale the weight to what works for you. Squat Clean and Jerks and Burpees over the Barbell will warm your heart for 14 minutes. It will be a blast! 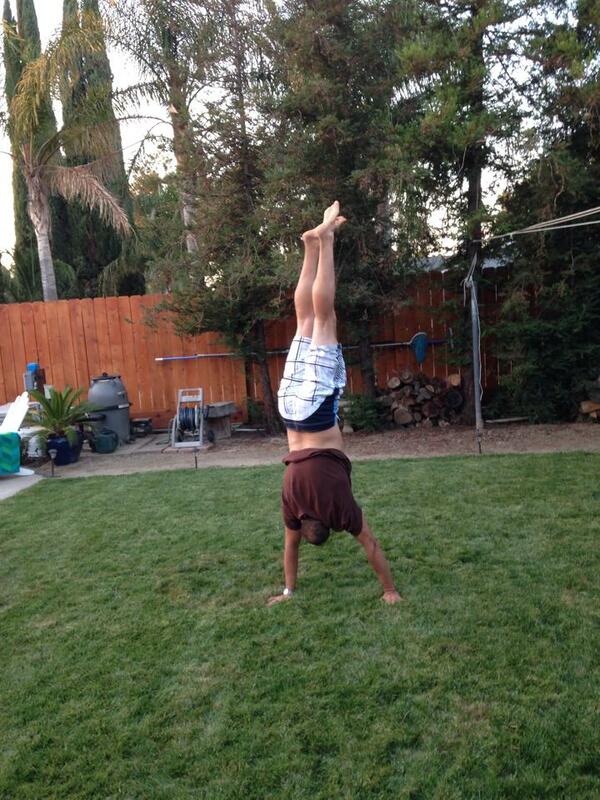 Mike B with his FIRST HANDSTAND EVER!!! Congratulations! Hand work pays off! With a continuously running clock, perform 1 Thruster 75/45 and 1 Pullup in the first minute, 2 Thruster 75/45 and 2 Pullups in the second minute, 3 Thruster 75/45 and 3 Pullups in the third minute, etc…until you cannot perform the require work in a given minute.